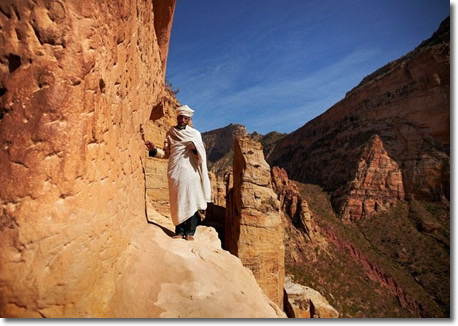 There are plenty of rock-hewn churches in Tigray, perhaps more than 120 many of them are found in Temben, Geraalta and Wukro. Almost all of them are semi-monolithic type of churches and mainly known by their multiple domes. Tigray’s rock churches date from between the 6th and 14th centuries (some possibly date back to the 4th century when Christianity arrived in Ethiopia) and have been carved in all manner of ways, some are very elaborate, cathedral-like, separated from the rock on three sides or actual four-sided monoliths, while others are more like caves with great stone pillars descending within, Unlike Lalibela, where the churches have been excavated down through the rock, the Tigray churches are mostly carved into cliff faces or from rocky outcrops. Was beyond the power of man, and that angels sent by God assisted in bringing about these stone wonders, many of the churches are painted with elaborate religious murals using colours derived from nature. But some have remained undecorated.